A portion of the north wall. 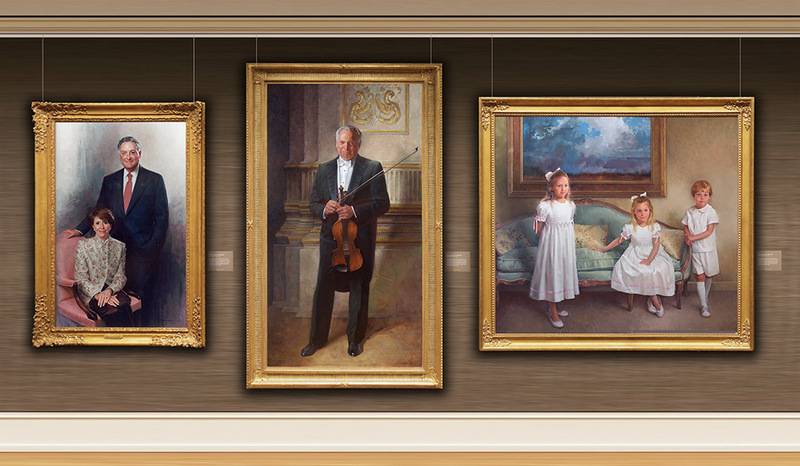 From left, Joan and Sanford I. Weill, loaned by Weill Cornell Medical College; Isaac Stern, loaned by Carnegie Hall; The Children of Jaime and Benjamin Wall, loaned by Mr. and Mrs. Wall, Spartanburg, South Carolina. Looking toward the southwest. The entrance to the right is the main entrance to the exhibition. The show's signature painting, The J.D.A. Barr Family, painted in 1973, dominates the entrance foyer. On the column in the center of the picture hangs a placard dedicating the African portion of the exhibition in honor of His Excellency Ambassador Antonio Deinde Fernandez of Nigeria, who died in November 2016. 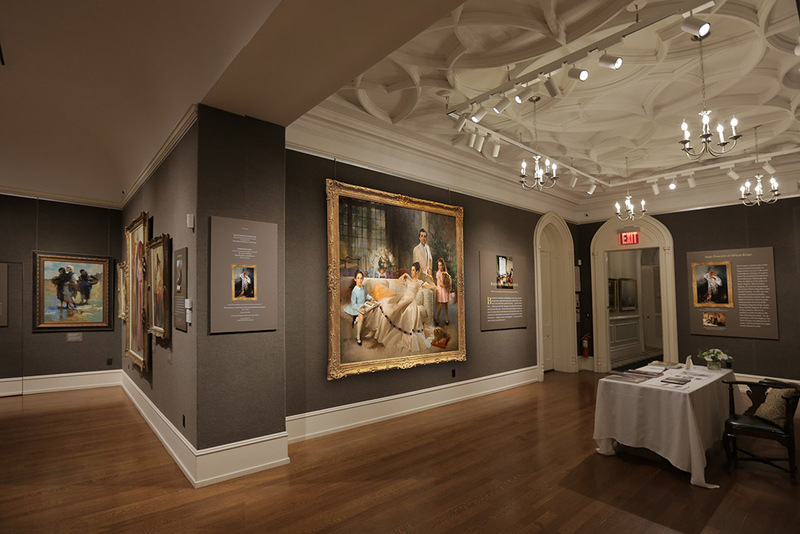 At the exhibition in New York, the Barr family portrait was displayed in a narrow black frame at the preference of the owner. We show it here - to the wider Internet audience - in a traditional portrait frame. Entering the exhibition foyer, this view appears on the visitor's left. To the left is Elaine and Kenneth Langone, loaned by New York university Langone Medical Center. Over the fireplace is President George W. Bush. This painting was the first version of the official White House portrait, painted in 2010. Approved by President and Mrs. Bush, this version was succeeded by several additional versions, in search of the appropriate background. 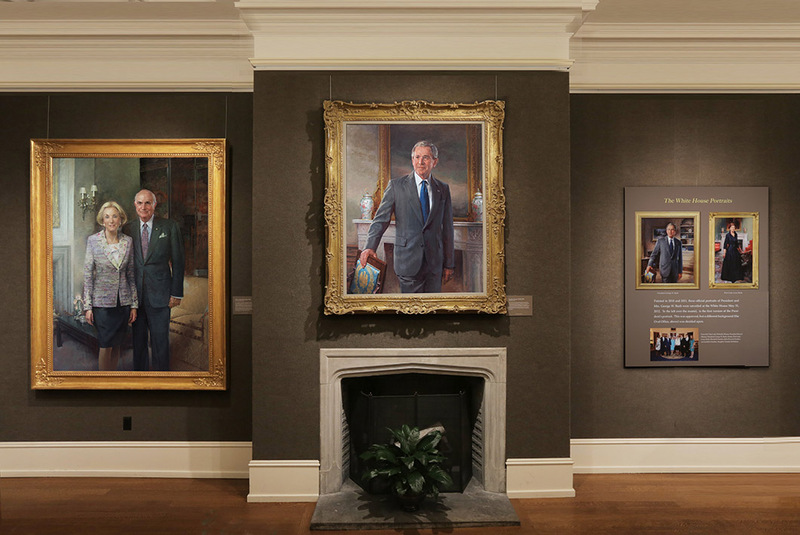 A display panel on the right shows the final official White House portrait of the President, plus the companion portrait of First Lady Laura Bush. The east wall. This is the group of Africa paintings, based on two trips to Nigeria in 1977 and 2004. From left, Kano Horseman, His Majesty the Alafin of Oyo, Procession from the Turbanning Ceremony of His Imperial Highness the Garsan Fulani of Kano, and Horse and Rider before the Great Mosque of Kano. 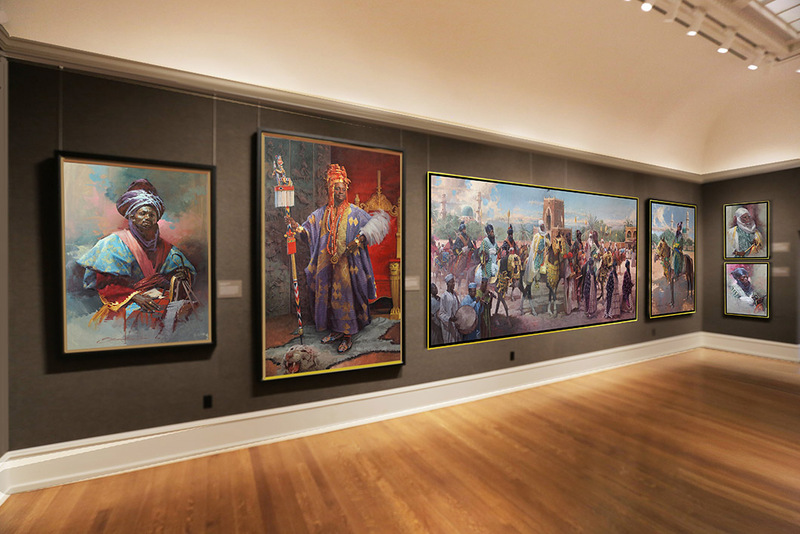 On the south wall are two small paintings, a study of the Garsan Fulani (top) and Black Turban. The "Procession" painting measures thirteen feet in length. These three figure paintings were selected for the exhibition from from the inventory of such themed pictures, most dating to 1974. From left: Straw Hat, Two Figures, and The Green Gown. These paintings are now available for purchase. An online catalog, with prices, is being prepared.